FSM Integrated Agriculture Census Pilot Testing Training held at the former Pohnpei Agriculture and Trade School Campus in Madolenihmw, Pohnpei. 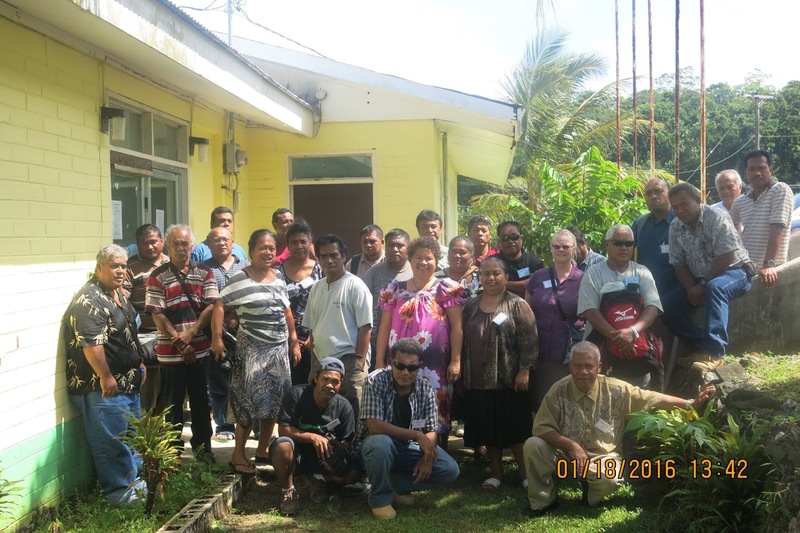 The Pilot Testing Training for the Federated States of Micronesia (FSM) Integrated Agriculture Census Project officially opened on Monday morning, January 18, 2016, at the former Pohnpei Agriculture and Trade School (PATS) Campus in Madolenihmw, Pohnpei. The integrated agriculture census project is a nation-wide effort to enumerate household activities in agriculture, forestry, livestock and fisheries. It will provide a much-needed statistical profile of the country in these sectors and enable the assessment of FSM’s capacity in food security. The census is the first of its kind; a multi-sector cooperative effort which will create an opportunity to empower our natural resource management and statistics agencies in evidence-based policy management and development. During the five-day training, the State Trainers will be coached on team management elements of this project, review the census questionnaire, practice in mock exercises and then field test the questionnaires in the pilot exercise. This Training was facilitated by the FSM Department of Resources (FSMR&D) in collaboration with the Food and Agriculture Organization of the United Nations (FAO), Secretariat of the Pacific Community (SPC) and US Department of Agriculture’s Natural Resources Conservation Services Agency (USDA-NRCS). The twenty-six training participants were from – Chuuk Department of Agriculture, Chuuk Marine Resources Department, Kosrae Department of Resources and Economic Affairs, Kosrae Island Resource Management Authority, Pohnpei Office of Economic Affairs’ Division of Agriculture, Pohnpei Department of Land and Natural Resources’ Division of Forestry, College of Micronesia – FSM’s Pohnpei Cooperative Extension Services, Yap Department of Resources and Development’s Divisions of Agriculture and Forestry and Marine Resources, and National Statistics’ Chuuk, Kosrae and Pohnpei Field Offices. The Training was opened by Mr. Mathew Chigiyal, Statistics Assistant Secretary, on behalf of the Department Secretary Marion Henry and welcomed by Ms. Alissa Takesy, Resource Management and Development Division, where they paid their highest respect to the land, traditional leadership, church leaders and communities in Madolenihmw for hosting this nation-wide training endeavor. “This training is a milestone for our Agriculture Policy and ‘a dream come true’ for those of us who have been in this work (agriculture) for years” explained Mr. Adelino Lorens, Chief of Pohnpei State Agriculture Division. “This census will help us to take stock of our natural resources, guide us in developing them, and put them on reserve for traditional use as we are experiencing in this sakau (kava) ceremony hosted by our Pohnpei State hosts” said Assistant Secretary Chigiyal at the closing reception. Ms. Marlyter Silbanuz, FSMR&D Agriculture Program Manager, and Ms. Brihmer Johnson, FSMR&D Statistician, concluded the training with each State training team selecting their pilot testing enumeration area, scheduling their respective field exercises and providing feedback to the training facilitators to finalize the census questionnaire and progress towards the census enumeration schedule in July 2016. On behalf of the Department and training facilitators, Ms. Takesy gave the closing statement and expressed her sincerest appreciation to the Madolenihmw local community members of Nanwei, Temwen, Leihak, Tamworohi, Keprohi, Pohnauleng, Mand, and Pohnmweli for volunteering their time in taking part in the pilot testing. For details, please contact the Department of Resources and Development, by email: fsmrd@fsmrd.fm or telephone: +691 320-2620/2646/5133. 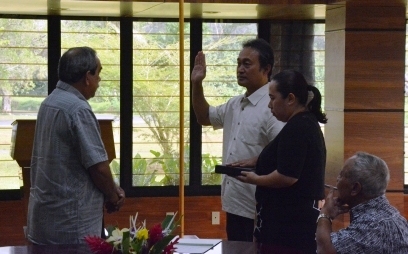 15 January, 2016, Palikir, Pohnpei – The Honorable John Fritz was officially sworn in as the FSM Ambassador Plenipotentiary to Japan by His Excellency President Peter Christian on Friday afternoon at the President’s Conference room. Emphasizing the significance of the ceremony, the Oath of Office administered by President Christian took place less than two months after the FSM 19th Congress re-confirmed Mr. John Fritz appointment to the post in November 2015. Ambassador Fritz served as the Deputy Chief of Mission (DCM) in Tokyo prior to his first Japan Ambassadorial posting in 2008; he served as the Ambassador to Japan during the FSM’s previous administration, from 2008 – 2015. In the presence of President Christian, Vice President George, Senior staff, Secretaries, family, and the FSM Honorary Consul in Fukuoka, Japan, Ambassador Fritz expressed his gratitude to President Christian and the Leadership for the confidence in him to continue to serve as the FSM’s Senior diplomat and representative to Japan. He also assured the President of his commitment to perform his diplomatic duties to the best of his abilities, emphasizing the need to represent the Nation’s interests, and further strengthen the close ties that already exist between the people of Japan, and the two governments. Also present at the brief ceremony were Vice President Yosiwo George, Secretary of Department of Foreign Affairs; Lorin Robert, Secretary of Department of Justice; Mr. Joses Gallen and other senior staff of the National Government. On January 11, 2016, FSM Vice President Yosiwo George arrived on Saipan to attend the state funeral for the late Governor Eulogio Songao Inos of Commonwealth of the Northern Mariana Islands (CNMI). 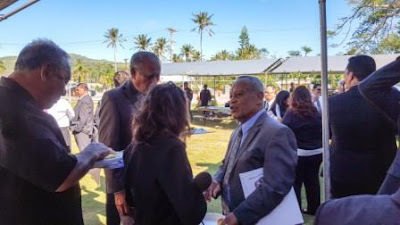 Vice President George was among many heads of state and government officials who attended the memorial tribute on January 12, 2016 at the Borja Funeral Home. On behalf of President Peter Christian, and the Government and the people of FSM, Vice President George conveyed sympathy to the family of the late Governor and the people of CNMI for the unfortunate passing of Governor Inos. Governor Inos held office from 2013-2015 and served as Lieutenant Governor of CNMI from 2009-2013 before he assumed office as Governor. Gov. Eloy S. Inos passed away at the age of 66, on Tuesday December 29, 2015, following recovery from open heart surgery in Seattle, Washington. Accompanying Vice President George was the FSM Guam Consul General, Mr. Robert Ruecho. On December 19, 2015 in Guam, the National Oceanic Resource Management Authority (NORMA) Board of Directors elected Mr. Churchill Edward as Chairman of the Board and Mr. Roger Arnold as Vice-Chair. 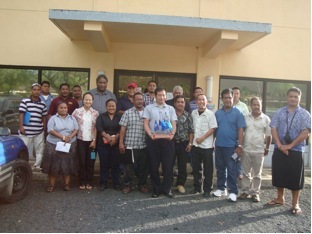 Directors include Mr. Peter Garamfel from Yap, Simpson Abraham from Kosrae and Ms. Yuko Nakasone from Pohnpei. Mr. Edward was a former Lt. Governor of Pohnpei State and a very active church leader and holds various other positions on Boards in Pohnpei including Chairman of the Board of Regents for College of Micronesia-FSM. With the new Board organized and officers elected, the Authority is now ready to conduct its business of managing the FSM tuna resources and generating the economic benefits from those who seek to fish in the FSM EEZ. In his letter to the President and Speaker of FSM Congress, Mr. Edward assured the President and Speaker and members of Congress that he and the new Board are prepared to work hard and have greater oversight of the activities of NORMA in the coming years.